Eco/Arts Authentic Experience Focus Groups planned this week in Mossman/Port Douglas (3 April) and Mareeba (4 April) have been postponed. The Mossman Focus Group was themed First Nation but now coincides with the funeral of a Traditional Owner. Out of respect for sorry business and because some key stakeholders won’t be able to attend, the decision was made to postpone. As we were delivering Mossman and Mareeba together, economising on time and effort, this also means Mareeba has been postponed. 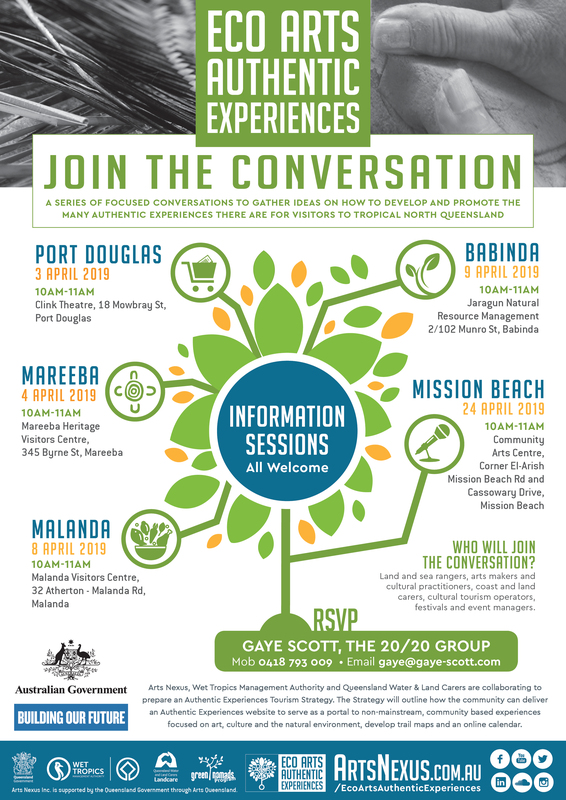 The focus groups at Lake Barrine (8 April), Babinda (9 April) and Mission Beach (24 April) are proceeding as scheduled and if you would like to attend and of these, please RSVP. We will however, keep you posted on new arrangements for Mossman and Mareeba. A series of focused conversations will be held across the region, to gather ideas on how to develop and promote the many authentic experiences there are for visitors to Tropical North Queensland. If you have a small business, run a group, have an idea or product to sell, this will be of interest to you. Are you involved in Land and sea rangers, art making and cultural practice, coast and land care, cultural tourism operator or a festivals and event manager? This will be of interest to you.